It's hard to believe our little Sweet Pea has turned ONE. We wanted to make a special celebration for her, so even though she may not remember the actual party but the pictures and our stories hopefully will make timeless memories for years to come. Since she was born in December, we naturally opted for Winter Wonderland theme with soft tones of silver, pink and white. 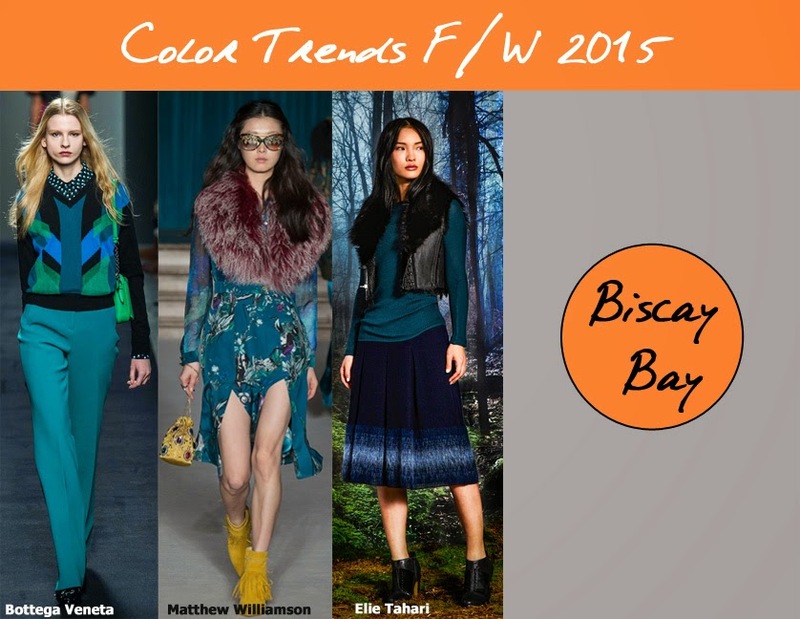 Imagine an enchanted winter forest with glimpses of sunrise. That was a main inspiration for decor. Most of the decor was DIYed by me. It was a night of treats, laughs and games with closest family and friends. Sweet treat table was a big hit with a Meringue cake, mint marshmallows and custom cake pops. Our house magically turned into a Russian Tea Room. Our Princess fell asleep halfway through the celebration, and even the loud noise of the party didn't bother her a bit. Christmas is almost here. Have you decorated a tree this year? I'm sure it looks beautiful! Mine does too as I became an avid collector of ornaments and a maker (some times) and I'm a fan of all the sparkles, lights and glitz. Every year my tree is bursting with ornaments, so I'm thinking soon I will have to rotate. 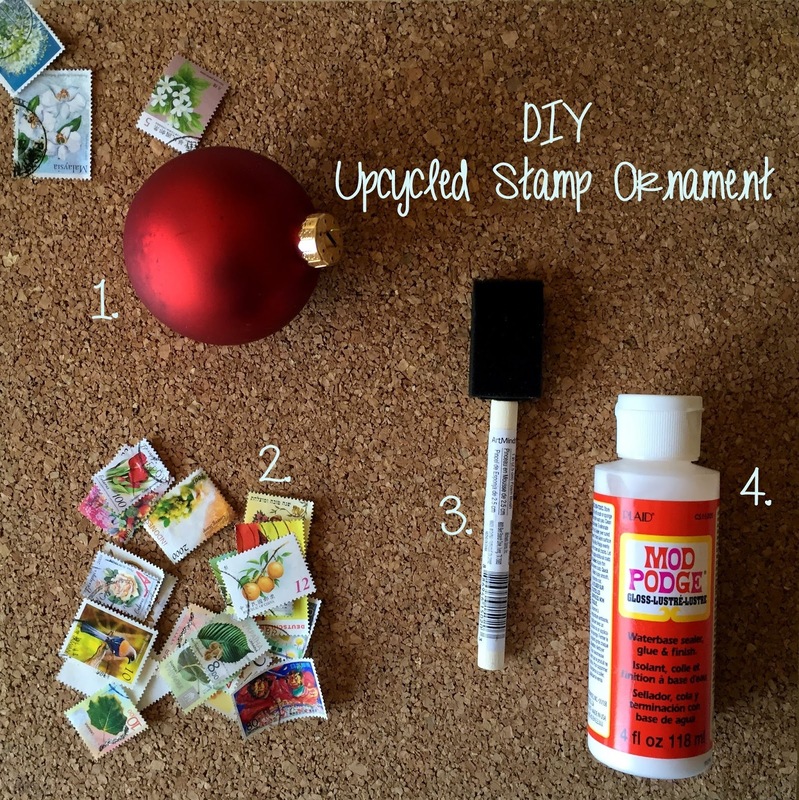 This year I stumbled upon an inexpensive, unique and super easy DIY project to utilize old unwanted stamps and old ugly ornaments... I just felt too sad to throw both away so I gave them a second life. Step 1. Remove the metal part from the ornament. Apply a small amount of Mod Podge onto the surface starting from the top. Step 2. 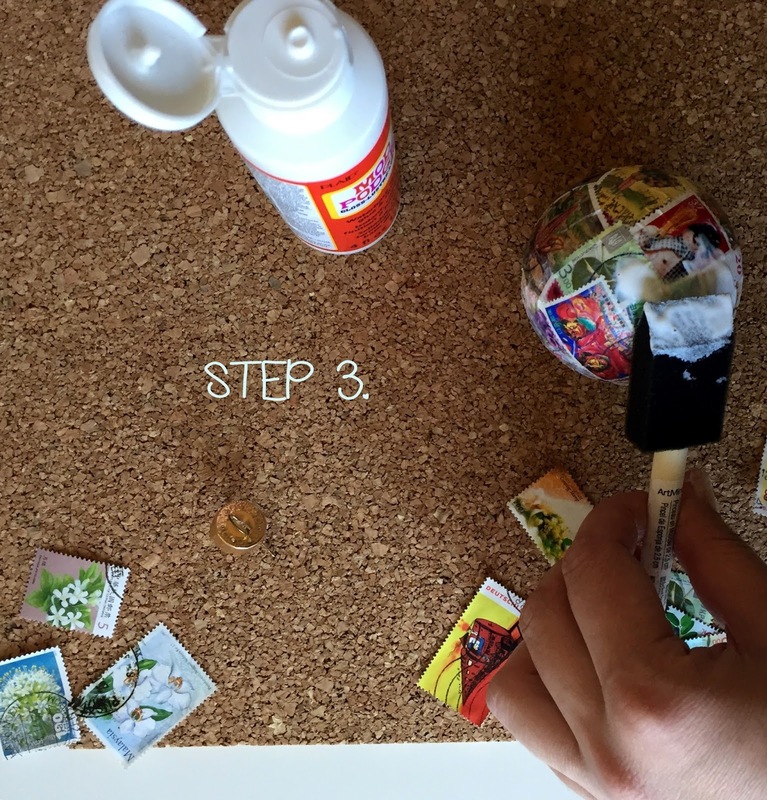 Start gluing stamps one by one, pressing them to the surface with fingers. Make sure there're no creases. 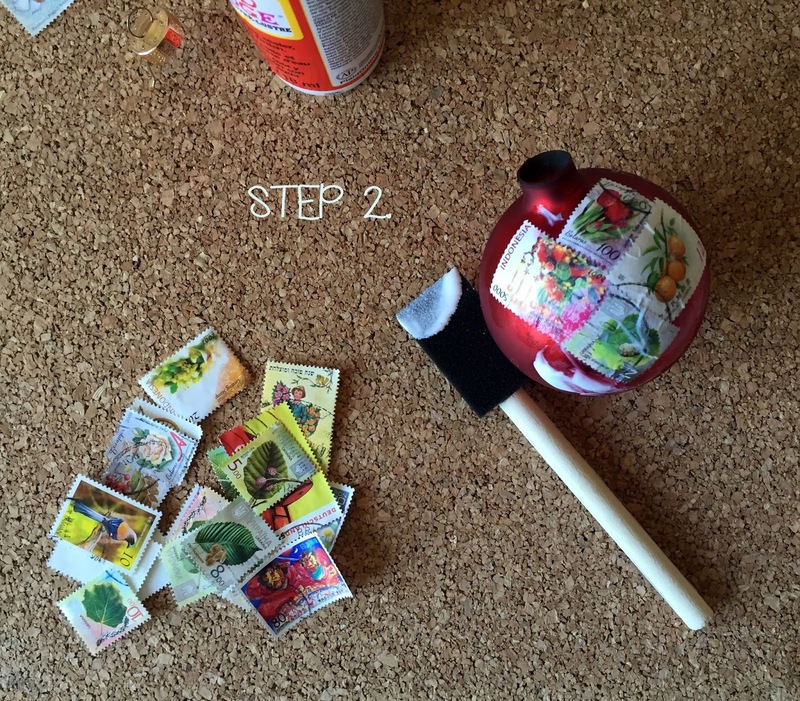 Work your way to cover entire ornament with stamps, overlapping the edges. Step 3. 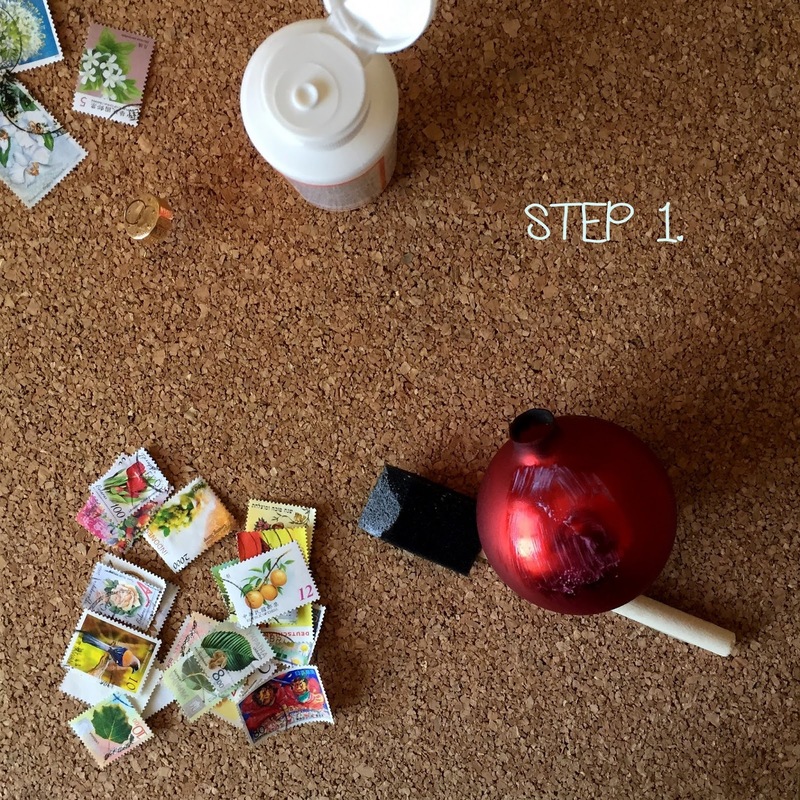 Once all stamps are in place, set the ornament on sturdy object and apply a second coat of Mod Podge covering the entire ornament. You are DONE. Let dry for 2 hours. Reattach the metal piece. The new upcycled ornament is ready to adorn your tree! "Look of the Day" post is here. This Black Floral dress has already become a staple in my wardrobe, as it's so comfy to wear and it is so incredibly versatile. With a small child in my arms trying to handle a gadzillion things at a time, I truly learned to appreciate comfort in clothes (of course, without sacrificing the style). I posed in this dress while the Indian Summer gave us few cozy days. Fabric Project No.15 "Black Floral"
As I mentioned in my last post I would work on my design for Fabric Project No.15. And here it is. This black woven poly-blend fabric has been collecting dust in my studio drawers for months until I finally decided to put it to good use. I love the tropical flowers adorning this fabric, they look so festive and romantic. After research and inspiration of possible designs, I gravitated towards a shirt dress, something chic but with a touch of functionality considering I'm running around with a small child :) Hence, my creations boasts some flap pockets, a standing collar and a belt. I can't wait to show you my finished design. 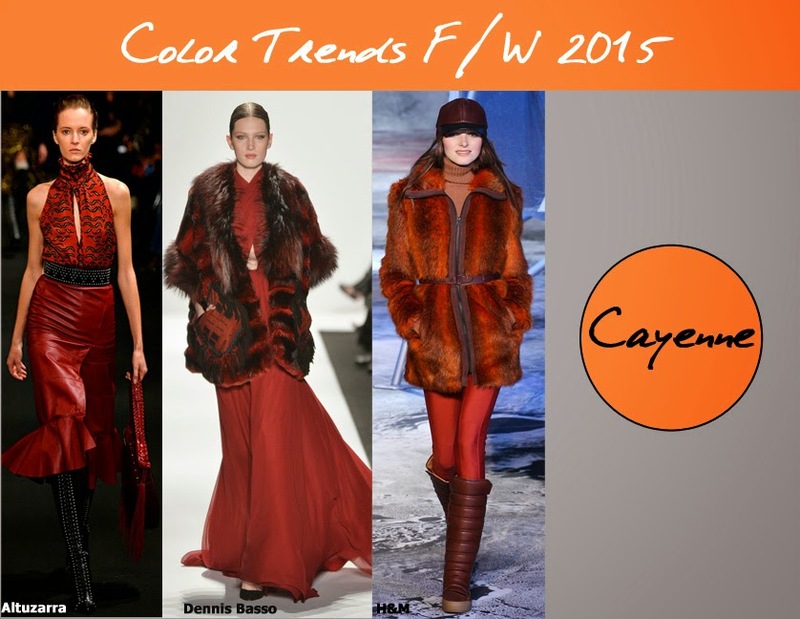 Stay tuned for "Look of the Day" Post featuring my design. It's been some time since I posted my "Fabric Project". 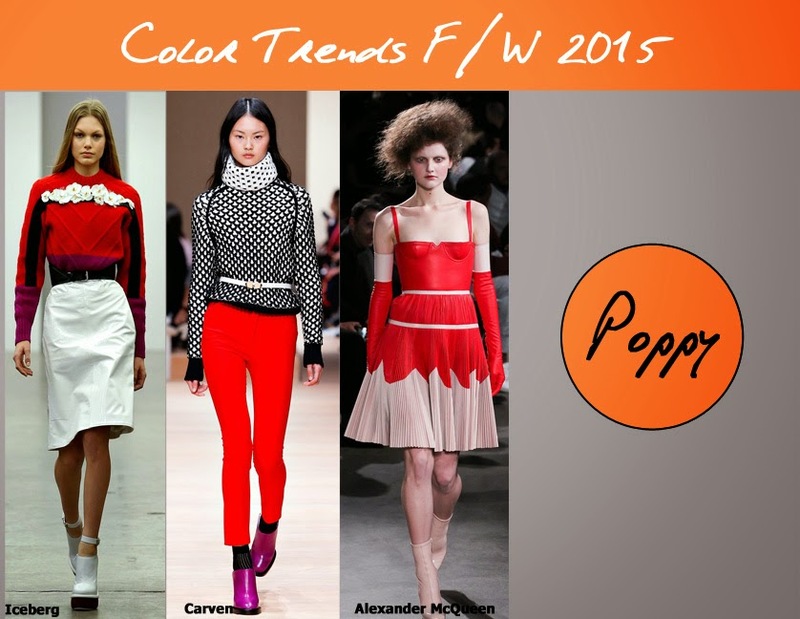 Over the years it became an outlet for self expression, design creativity and inspiration. But it hasn't been forgotten especially since I look back to Look of the Day posts and rows of unique outfits in my closet. Since I had a baby things have shifted dramatically. If I said before that I didn't have enough time, now I really fall short. But I try to stay positive and find time, even if there's none. I'm inspired by many successful fashion bloggers who manage to jiggle motherhood and full time blogging. I promise I will start blogging more and won't give up. 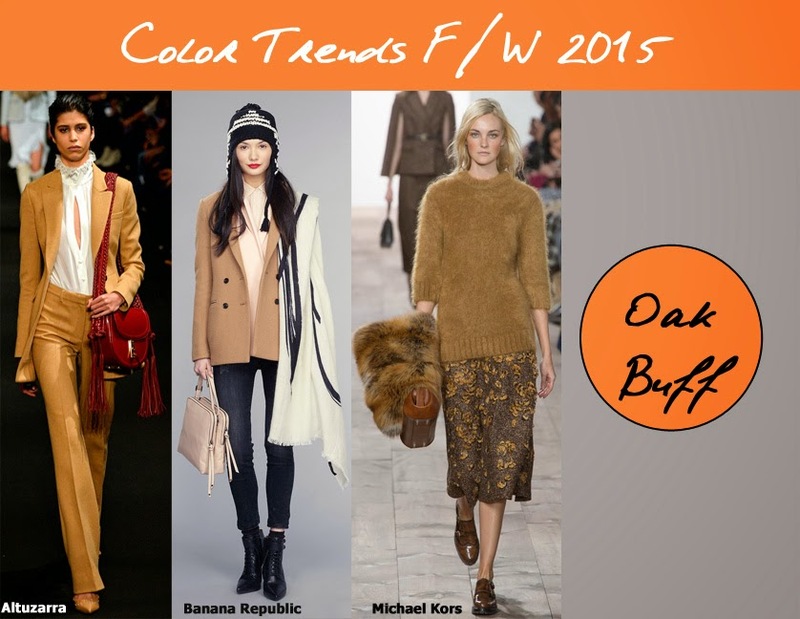 Now, let's talk about my current fashion obsession. 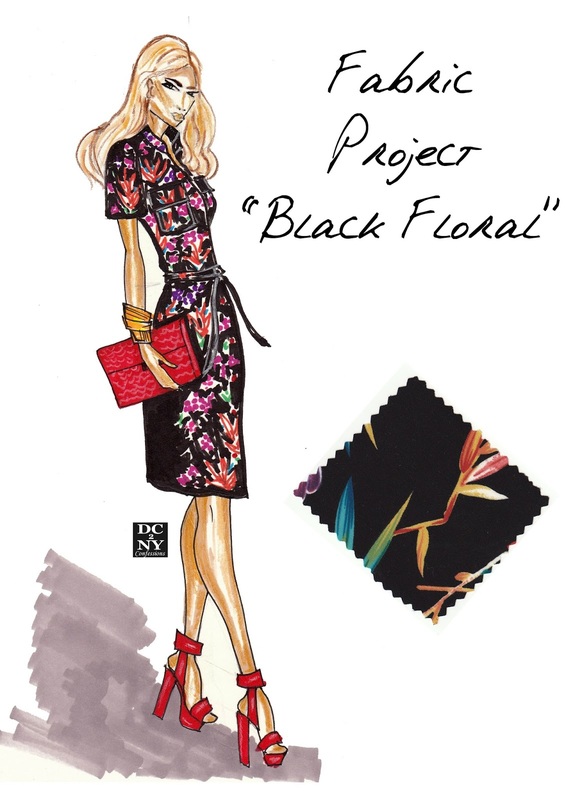 Fall is coming our way soon, so I started noticing many designers go back to a so called "country chic" style, particularly Black Floral Prints. 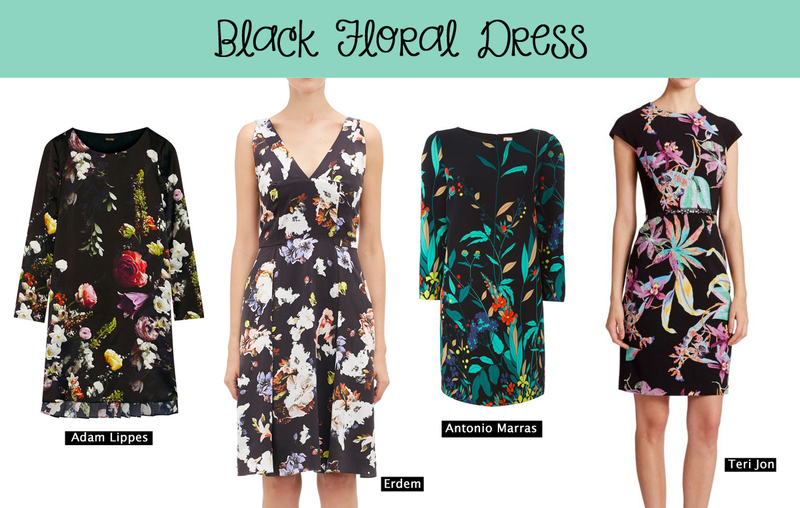 I found a few dresses that look both chic and feminine. And luckily, I dug up a fabric that was given to me by a friend that has the same pattern. For years it sat in my studio, waiting for its fashion moment. And now the time has come. So, here's my inspiration board. These prices really amaze, but I feel lucky to make a dress at the fraction of the cost. Dress design coming up next. 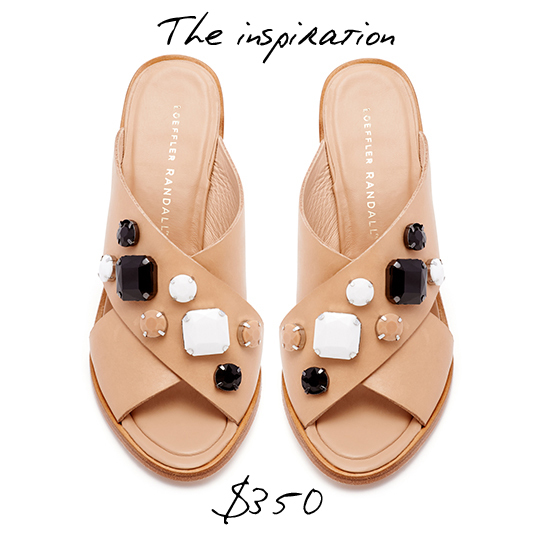 Begin gluing cabochons from the center of each sandal as shown. Continue gluing, attaching each cabochon in desired pattern. Finish attaching all the cabochons. Let dry for 8 hrs. 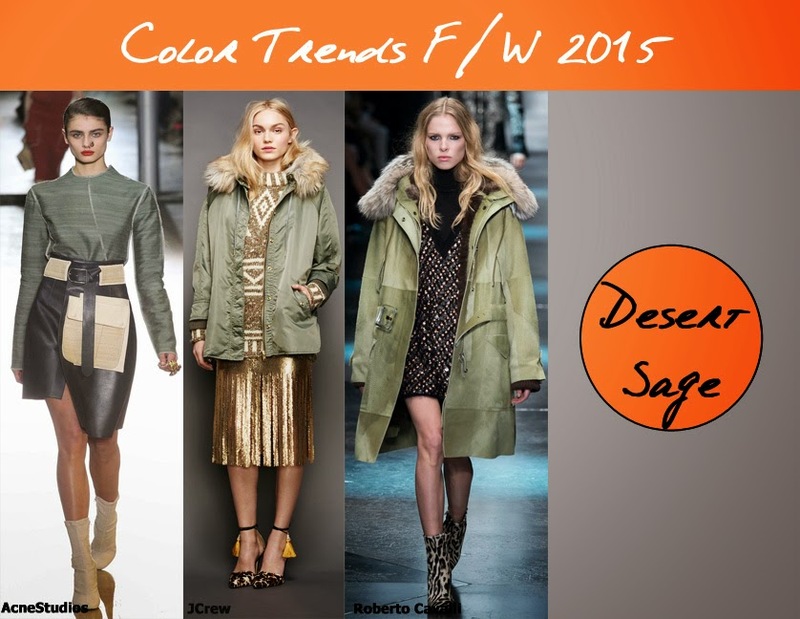 As Fashion Weeks marched the world the last couple of months, trend colors emerged for us, consumers to think about and keep in mind before the next season arrives. 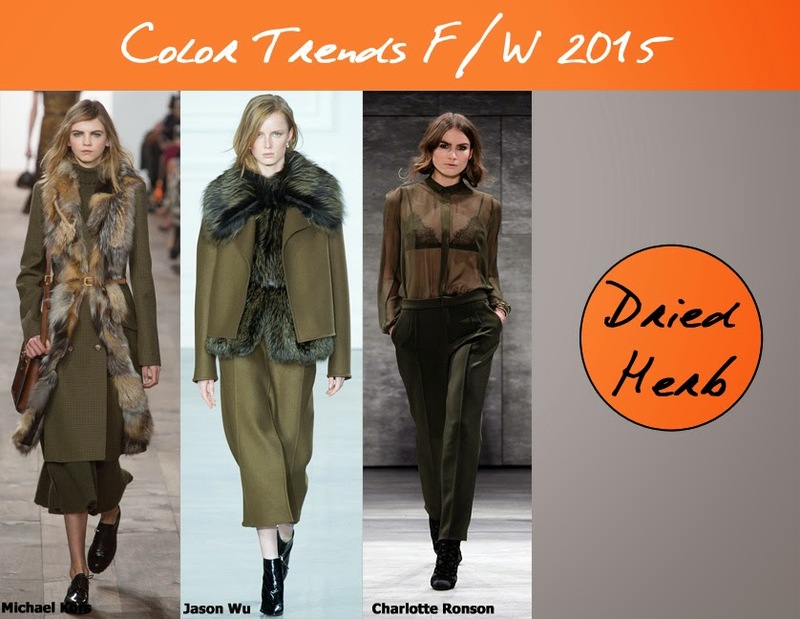 A few shades have caught my eye and became particular favorites for the Fall 2015 season. Among them are sophisticated and chic earth tones of Herb and Sage paired with comforting Oak Buff and finishing off with with invigorating Biscay Bay, robust Cayenne and rich Poppy.